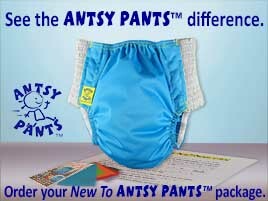 Want to know more about our Antsy Pants™ Alerts before you sign up? Sounds good. I don't like to give up my email address randomly either. gear will make potty training easier on you. I'm here to help. I'll send messages along that I hope will help you and your child make a low-stress transition from diapers to fully day potty trained on your own timeline, whether your child is starting at 10 months or 3 years. Yes, absolutely. Our policy is no spam, ever. Fly Baby, LLC and GetAntsy.com will not send you a single email unless you have willingly given us your email address either by making a purchase at GetAntsy.com or by opting to receive email from us and then confirming your inclusion in the list by clicking the confirmation link that you receive by email. Even then, if you decide in the future that you don't want to receive email from us, it is simple to change your subscription by clicking a link at the bottom of any email. How often will I receive Antsy Pants™ Alerts? The tips themselves are sent as a series, one message per day at most. As part of your subscription we will also occasionally send special messages to tell you about something new that we think you'll be interested in. As a free gift to you, our very own Potty-Ready Quiz is ready for you to download once your subscription to Antsy Pants™ Alerts is confirmed. Your first step toward preparing for potty training, or maybe getting it back on track, is determining how much difficulty you will likely encounter starting full-on potty training right now. You can use the results of the quiz to decide whether now is a good time to start potty training, or whether you might want to hold out awhile longer before you give it a shot. Use the following form to sign up for Antsy Pants™ Alerts right now. An email will be sent automatically to the email address you provide. If you don't see it in your inbox, make sure you look for it in your spam folder and follow your email provider's instructions to give email addresses ending in "@getantsy.com" (without the quotes) permission to send you email. The email you receive from us contains a link you must click through to confirm your subscription. As soon as you click the link you will be taken to a thank you page back here on GetAntsy.com where you'll find the quiz download. Ready, set, go!